Good morning polished world! How are you all doing on this fine Sunday? I've had quite the busy weekend so I haven't been on the computer much to be posting. Plus I'm paranoid that my nail isn't going to grow out fast enough and I'm going to run out of posts before I can start doing nail art again. That's a tad dramatic of me seeing as in another week it will be perfectly fine. I've had swatches on for a week and I'm already over it. Today's design is one I did before that little piece of nail grew out and broke off causing the stubby nails. It is lilac season and I feel like I haven't done my lilac nail art in a long time so it was due. Of course I took photos with the lavender polish and the blue polish, and all the lavender bottle shots were horribly blurry. Ugh, so here I have a beautiful manicure, with a crappy bottle shot. It is a wonderful manicure though, isn't it?? I absolutely love my lilacs. 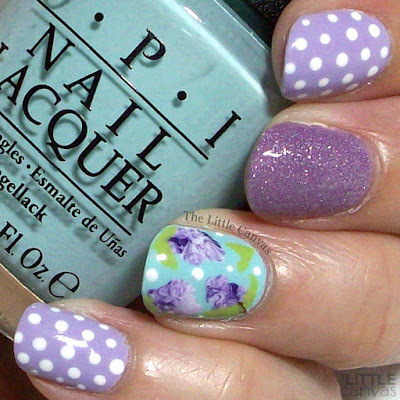 To get the look, I take a dark purple, a lavender, and a white polish and drip them on a paper plate. I then take a dotting tool and dot it into all three of the polishes, then directly onto the nail creating marbled dots. To me, this looks most like a lilac. What do you think? Fan of this look? Mad that my purple bottle shot didn't end up working out? !